AndreaMosaic is an amazing little program that takes one photo as a source, then recreates it using a pool of other pictures, all selected by you. AndreaMosaic analyzes the colors of each photo in the pool, then matches them to areas of the source photo. The more photos in the pool, and the more colors they contain, the more accurate the results will be. 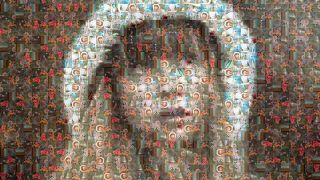 AndreaMosaic is great fun, and you can create interesting effects by adjusting the number of tiles, how many times each photo can be repeated, and whether tiles can be rotated. Nature photos work particularly well as tiles; the software's developer Andrea Denzler uses a bank of over 20,000 snaps, though you can get great results with far fewer. Using your own pictures is great fun and very satisfying, but if you need some extra pictures to get started, you can find some great copyright-free ones at Pixabay.